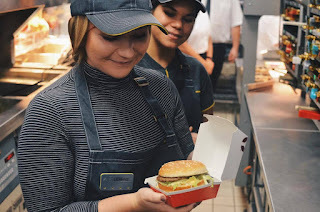 I was recently invited by McDonald's to join them at the Newbridge Industrial Estate branch and find out more about the changes and new systems being put in place. I have to admit, I was torn between excitement and a little apprehension. Let's face it McDonald's is many people's (including myself) guilty pleasure so the allure of getting to make my own Big Mac was pretty strong. On the other hand, did I really want to find out what goes on behind the counter? Would it put me off my cheeky (often drunken) McDonald's? Spoiler alert, it definitely did not, if anything my visit has made me feel significantly less guilty about my guilty pleasure. I met with the McDonald's Scotland team and was taken around the restaurant to show off the latest features. The first of which was the self-service machines, something I was already a little familiar with (they are definitely the fastest way to get your meal when it's really busy). The self-service machines are essentially a giant tablet where you can easily navigate your way around the menu and select your meal. You can even personalise your burger (maybe remove the gherkins or add an extra slice of cheese) on the machines. One thing they pointed out that I thought was really interesting was how they are encouraging children, in particular, to make smarter choices. When you're on the Happy Meal section, there are plenty of alternatives to fries and a fizzy drink. In fact, fizzy drinks are the very last option under 'other drinks'. I remember when I was young there weren't as many options so it's great to see them giving children more balanced choices nowadays. Another feature of the self-service machines I wasn't aware of was the table service. That's right, McDonald's now do table service. You can order at the self-service machine or the counter, pick a section of the restaurant (the sections are clearly labelled) then sit back and wait for your burger. All you have to do is leave your receipt on the table. The staff will bring your burger straight to you, as well as any condiments, straws or napkins you might need. I think big families will love this new feature, as well as us lazy Sunday McDonald's kind of people. McDonald's even have an app now, available on all app stores. From here you can order your meal so it's ready for you when you check in at the restaurant. You can save your favourite meal, so ordering is faster than ever. The next step is delivery, which is being tested in selected restaurants – something I’m pretty excited for! McDonald's raise a lot of money for charity, which is something I not only learnt during the visit, but something they want you to find out more about in their restaurants. Near the counter of some of the new McDonald's, there are screens that show off exactly where their fundraising go. One thing they're big on is supporting community football across the UK, they've been doing it for over 15 years. The carrier bag charge in Scotland and Wales goes towards the Ronald McDonald House Charities that help provide a home-away-from-home for families whose children are in hospital. To top it off, their packaging all comes from sustainable sources! My personalised apron and cap! Finally, we donned classic McDonald’s aprons, caps and (unflattering but practical) hairnets and got to see the kitchens. I've got to say I was really pleasantly surprised – it was immaculate. Every element is in its precise location, designed for maximum efficiency (it’s needs to be, on a busy weekend, McDonald's are serving up a LOT of burgers at a time). There’s also no one flipping burgers! Machines have taken over on that front. They have a line of what look like industrial strength George Foreman grills, designed to detect the size of the patty and cooks them for the appropriate time. There's no secret, dodgy recipe here! The meat is 100% British and Irish beef from the forequarter and flank – literally all they add is salt and pepper. In fact all their ingredients are fresh, something that very few people believe. The chicken McDonald’s uses is all 100% breast meat (yes, even the oddly shaped nuggets) and all the suppliers they use must adhere to their high standards of animal welfare. On top of this, their pork is British, their eggs are free range, their fries are cut from British potatoes, their fish comes from sustainable sources and all their milk comes from UK dairy farms. They're even actively working to cut down on their salt content. Don't believe me? Check out their website for yourself. The most exciting part of the event was getting to assemble our very own Big Mac. The kitchen is lined up so efficiently, making our own burgers was quick and easy. The buns are obviously first, you pop them in the toaster that is clearly labelled for what bun goes where. While they're toasting away you grab your box (there's even a specific way to place it). Once your buns are in the box you add on the cheese and condiments (I'm not a gherkin gal so I cheekily missed out on that part) including the signature Big Mac sauce. Then you get your burgers out the heated drawers and pop them on the buns… and you’ve got yourself a classic Big Mac! The overall experience was really fun, and to be honest eye opening. The staff are so enthusiastic about their company and what they do. Everyone was really excited about the evolution of McDonald's and the changes that they are continuing to put in place. It was also a bit of a relief to know that the meat and other ingredients are fresh and sourced from British farmers. They're completely honest about what goes into their food, you can even see all the nutritional info for your meal on the self-service machines. I also really appreciated finding out where all their charity donations have been going. Thanks again to McDonald's for having me, I'll be seeing you again soon for my usual order of cheesy bites and a quarter pounder with cheese (my favs!). To find out more for yourself about the evolution of your new McDonald’s head over to their website. *Disclaimer: This is a collaborative post with McDonald's, but as with all my content, all opinions are 100% my own.